Today was a lower body workout at 7am. My lower body workout has evolved from just squats to squats and deadlifts and then to alternating leg curls and squats and where it is right now, alternating leg curls and squats, deadlifts and finishing off with leg extensions. 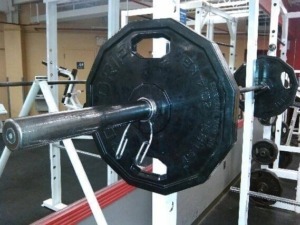 The good news for today is that I first hit my high for squats by doing 5 reps of 120 lbs. I have been making consistent progress for several months. I find that it is very important to remain consistent otherwise I have experienced losing muscle strength pretty fast which is no fun because I have to start back up from zero! After I did squats with 120lbs for 5 reps, I did a couple of reps with 125lbs and then went for my max weight on squats ever which is 135lbs. The last month or so I have been doing 135lbs for 1 or 2 reps but today I did 135lbs for 5 reps. Admittedly, the last rep was no good, I was tired by that time, but the first four were fine. I even recorded the reps and hope to show you soon, I think my squat form was good, but if you have some constructive criticism, please criticize so I can get better. The less good news but not terrible is that I also recorded my deadlifts and was shocked at how bad my deadlift form is. So I see that I have alot to work on with deadlifts. Essentially I was straightening my knees before I was upright in the deadlift. When I get the video I will let you see and you can let me have it! The point is that you can get incrementally stronger day by day and week by week if you stay the course. Stay consistent and go up in weight gradually and you will build the muscle that you need to get stronger and fitter in mind and body.